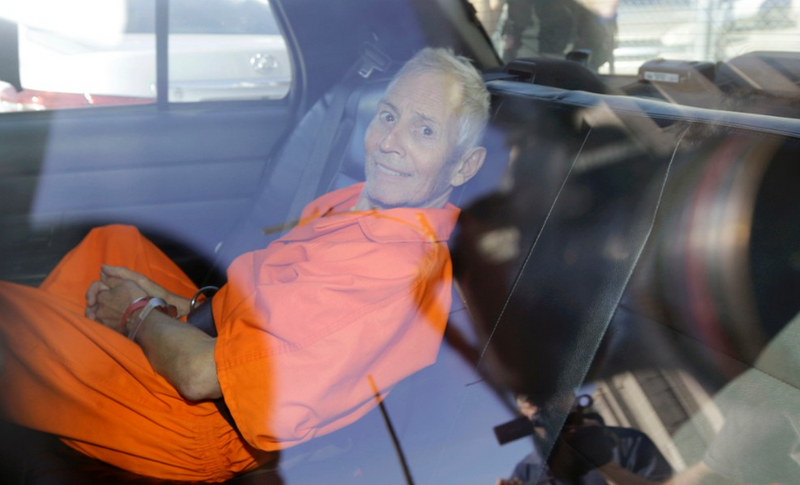 Robert Durst was arrested last week for the alleged murder of Susan Berman. In 2003, the eccentric real estate heir was acquitted of the 2001 murder Morris Black - although he did admit to dismembering his body and dumping it in Galveston Bay. Many suspect he's also the killer of his former wife, Kathleen "Kathie" McCormack. Durst was the subject of the recent HBO Documentary-Investigation "The Jinx" in which valuable evidence was produced. In this image he's seen in back seat of a police vehicle with handcuffs on dressed in a classic orange prison jumpsuit - yet it's the expression Durst is wearing on his face that should raise our alarm bells. Many would label this as a "smile" - however it's anything but a sincere smile. Although his mouth has its corners contracted - they are primarily laterally vectored and not upwards - thus he has no concave-up furrows in his lower eyelids (a sincerity requirement in the context of a smile). In addition and very dramatically - Durst's eyes are opened widely - rather than partially closed - which complete negates any possibility of a true joy-happiness smile. Also termed a "Duchenne" Smile, a sincere smile must have a non-contracted/relaxed forehead. Despite the resolution being poor here, we can see Durst's forehead is indeed contracted - and more prominently in its center - and his left-central portion of his forehead is elevated (an "Elevated CFC"). But we shouldn't stop with the fact Durst's smile is insincere though. What else is wrong? For one, he's smiling out of context - which is a huge red flag - particularly in the back of a police car with handcuffs on. Moreover, when an elevated CFC is seen in the context of a full but often partial "mouth smile" (albeit insincere) - this is either a signal of arrogance (although there are other expression of arrogance), contempt (this is one of several signals which may indicate contempt) or incredulity (and once again - there are other nonverbals indicating disbelief). We all feel contempt, incredulity and arrogance once in a while - this is part of being human - therefore we all will display the elevated-CFC with an (insincere) mouth smile (usually a partial one) on occasion. However, when a person's facial expression displays this configuration chronically - there is an extremely high correlation with a sociopathic personality.